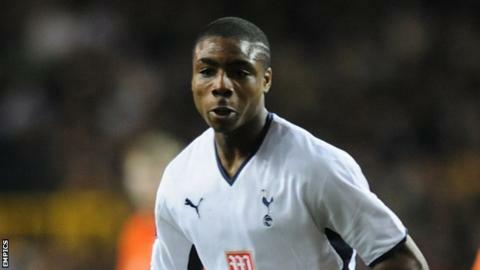 Charlton Athletic have completed the loan signing of Tottenham Hotspur forward Jonathan Obika. The 22-year-old, who has also signed a new one-year contract with Spurs, joins the Championship side on a deal until the end of the season. Obika has had eight separate loan spells away from White Hart Lane since his debut in 2008. "After losing Bradley Wright-Phillips I just felt we were short in the striker department," manager Chris Powell said. Obika has had four spells at Yeovil Town and also played for Millwall, Crystal Palace, Peterborough and Swindon. He has scored 20 goals in 95 appearances in the Football League. Powell says he has been monitoring the youngster, who has made two appearances for Spurs in cup competitions this season. "Jonathan is a player we have kept an eye on this season in a number of games," Powell told the club website. "I saw him when he played against us [for Yeovil last season] and he has an eye for a goal. "He is a player full of potential and it is a chance for us to have a good look at him and hopefully he will come into the group and make an impact."